Unless you’ve been living in a bubble (in which case, we’re very sorry to hear that and hope your allergies are better now), the Whitecaps are in the MLS Western Conference semi-finals and will face off against their hated Cascadian rivals, Seattle Sounders, on Sunday October 29th at BC Place and Thursday November 2nd down at the Clink. 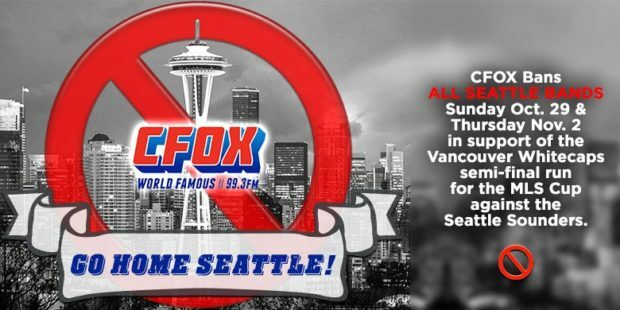 It’s been great to see so many in Vancouver throwing their weight behind the ‘Caps this week and to show their support, the World Famous CFOX (99.3FM) is banning all Seattle bands from their playlist for both game days. That’s right, that means no Nirvana, Soundgarden, Band of Horses, Alice in Chains, Foo Fighters, Kenny G, Sir Mix-A-Lot, Modest Mouse, Kenny Loggins, Heart and no Queensryche! “To show our support, we’ve taken on the challenging task of banning all Seattle-based and Seattle-originated bands from the CFOX playlist, which for a rock radio station, is kind of hard” The World Famous CFOX, Program Director, Dustin Collins stated. A great initiative. We don’t want you burning or destroying your Seattle band CDs and vinyl though, well unless it’s Macklemore, we’re totally okay with that. As you, hopefully, know, we have the AFTN Soccer Show on CiTR radio at 11pm on Sundays. We’ll try and encourage the station there to do the same. At the very least, we’ll be encouraging our listeners to remove their Kurt Cobain posters from their walls and replace them with pictures of a buff Jordan Harvey and Erik Hurtado. Hell, maybe we can just play E-Money music on both those days instead. So well done CFOX. We encourage other Vancouver media and businesses to take on similar initiatives. You might want to consider no Starbucks coffees those days, and shops can put away all their flannel plaid shirts.